As a counterweight to any kind of cynicism I would like to suggest an artist whom I least suspect of possessing this state of mind: Tanzanian superstar Mbaraka Mwinshehe Mwaruka. He is - to me at least - a shining example of a joyful mix of naivety, amateurism and innocence. And he manages to combine this with a positive attitude, a potent dose of originality and fine sense for good music. He is one of the many artists whom I wish I would have had the chance to meet, if only to confirm what I hear in his music. In certain aspects he reminds me of the late Remmy Ongala, whom I did have the fortune to meet (several times even), and who convinced me of his sincerity when he claimed he was singing for the poor people. The vigour with which he claimed this, the body language, the open attitude: the cynic in me was unable to resist this. It was hard not to like the man. 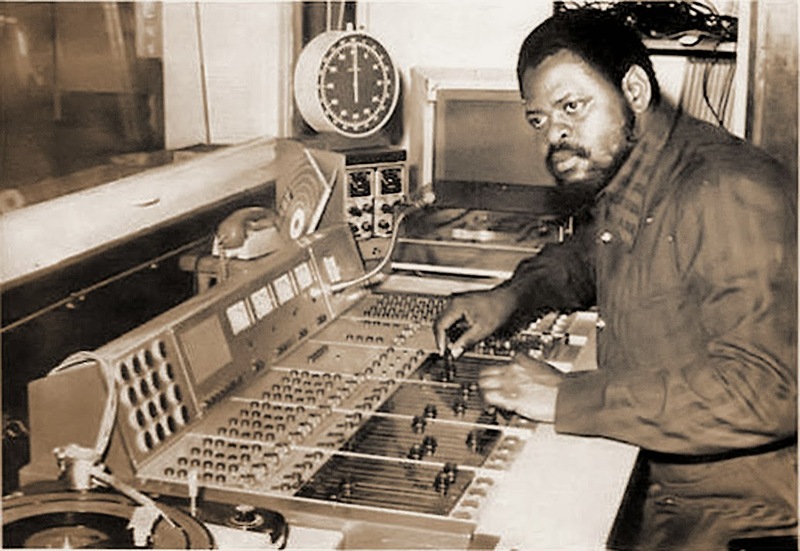 Mbaraka died at a time when my African music collection consisted of no more than a dozen cassettes. I first heard his music in the mid-1980s when through the contacts with the Dutch management of Polygram (then still owned by Philips) a local record store started importing albums directly from Kenya. I was sold to Mbaraka's disarming sound right from the start. The start being the confusingly named "Ukumbusho Volume Pesa No. 1". 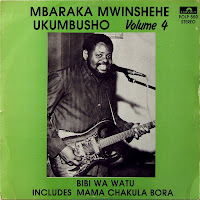 This volume contains songs of Mbaraka Mwinshehe with his orchestra Super Volcano. The orchestra is not credited on the sleeve, but Mbaraka himself cites the name of the orchestra in the songs. This lack of info on the sleeve in itself is not unusual, given the state of literacy of the target audience. But it does suggest that the marketing department never imagined a European listener would ever be interested in this product of 'native culture'. Most of the songs are in the typical Mbaraka style, with the usual references to Congolese sources of inspiration, such as Franco and Docteur Nico. But there is always an authentic twist. While Franco would go full-blast after a carefully constructed build-up like the one in the first track, "Bibi Wa Watu", Mbaraka instead (after 3'34) opts for a subtle, understated and very elegant 'mipanza' (see this post). I love it. Every song comes with such a 'twist'. In "Dina Uliapa" he clearly uses Nico's style, but ends with a typical Mbaraka touch, with the solo guitar strumming and the rhythm guitar moving to the forefront. I realise this may be a bit of paradigm shift for some of the readers, but the first song on the B-side seems inspired by Tabu Ley's Afrisa of the early 1970s. If you imagine Rochereau singing instead of Mbaraka, I am sure you'll hear it. Of course, Mbaraka lacks the pretence and the intellectual air, and this is not only reflected in the singing, but also in the down-to-earth sax. The song which stands out on this lp is, however, very much an original. "Masika Mtindo Mpya" is one of those songs that will force its way into your long-term memory. Despite the rather monotonous rhythm, that trumpet (! ), Mbaraka's guitar: who can forget this song? As a bonus I would like to share with you these five alternative takes, which were sent to me by Mr. Msomali, who you may remember (from this earlier post) suggested there must be televised recordings of Mbaraka. We are, by the way, still looking - and I hope you are too! 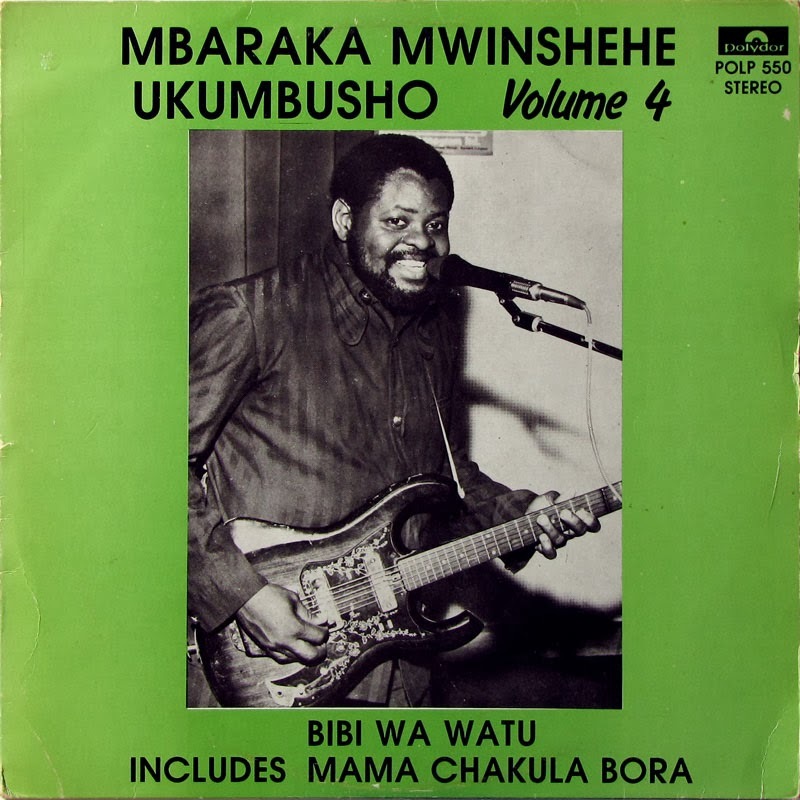 He sent me these five songs, recorded at Radio Tanzania Dar Es Salaam (RTD), adding: "These 5 songs are authentic/original songs Mbaraka recorded at RTD,and please listen at the way he plays the guitar from minute 4'05 in "Waache Waseme", and that is vintage Mbaraka." Of these five tracks three (tracks 2, 3 and 4) have been included in Ukumbusho Vol. 3 (POLP 542), one (track 1) in Vol. 7 (POLP 566) and one (track 5) in POLP 502. Most names you'll recognise, and "Suniasa unipoze moyo" is called "Nirudie Mama" on Vol. 3. I subsequently asked him how these songs compare to the versions released by Polydor (Polygram). His answer typifies the attitude of the African listener: lyrics first, melody later. "The lyrics of the the five songs are almost the same, with only some words here and there being different. For example in the first song, "Watalii" (tourist), he is asking/telling prospective tourist that by visiting Tanzania they will be visiting majestic/magnificent game parks like Ngorongoro Crater, Serengeti, Manyara (the only place in the world where you can see lions climb trees) and Mikumi park (please note that he forgot Selous game reserve, one of the biggest and most beautiful game reserves). He also mentions Kilimanjaro,the highest mountain in Africa,and also says the country has beautiful almost untouched beaches. The only difference between the Polydor/RTD versions is the animals he mentions in the song. In this original RTD version he mentions only 4 animals: elephants, lions (climbing trees), giraffes and zebras. Whereas in the latter Polydor version he mentions 5: elephants, lions, giraffes, does not mentions zebras but then mentions 2 new ones, buffalo and leopards (if singing the song today he could be asked to drop the poor giraffe and put rhino instead, thus mentioning the so-called Big five). And the other difference of course being the quality of the music, being much better in the RTD original." "Your favorite, "Vijana sikilizeni"(Teenagers/students listen [to my advice]), is a song with a timely and important message to students (mostly those attending boarding secondary schools) not to engage in and waste their time into forming boyfriend/girlfriend relationship, instead of studying hard to better their future, reminding them that their parents spend a lot of their hard earned money to send them to those expensive boarding schools, only for their offspring to risk being expelled from their studies for engaging into those illicit love affairs. He warns them that they risk losing both their studies and also their so-called lovers, as when they are expelled they will both normally returns to their parents`s homes, which usually are in different regions. Lastly, he sings of the pain these youngsters inflict on their parents, who not only lose all the money they had invested into their children`s education, but also see their kids throw away the chance to get proper education and have a chance of a better life in their future. It was a meaningful song that was really warmly welcomed by parents and all governments in the region, as it had a very important message for the young people in education. It did not hurt also as it really was as you say a very good song musically, and especially this original RTD song." Mr. Msomali estimates the songs were recorded in either 1970 or 1971. * Going by the volumes - up to 13 (!) - on offer on various websites, including i-Tunes (a site which I simply refuse to visit..).